By the time Chef Giorgio Rapicavoli reached his mid-twenties, he had already led at a handful of respected restaurants in his home town of Miami, Florida. He also rubbed elbows with world-famous chefs; was lauded as the city’s first winner of Food Network’s Chopped; and owned, operated and killed it at the pop-up, Eating House before making it a permanent fixture on the 305’s evolving culinary scene, along with the Coconut Grove favorite Glass & Vine. Now, with a Chopped Champions win and three James Beard nominations under his belt, Rapicavoli is hotter than ever. 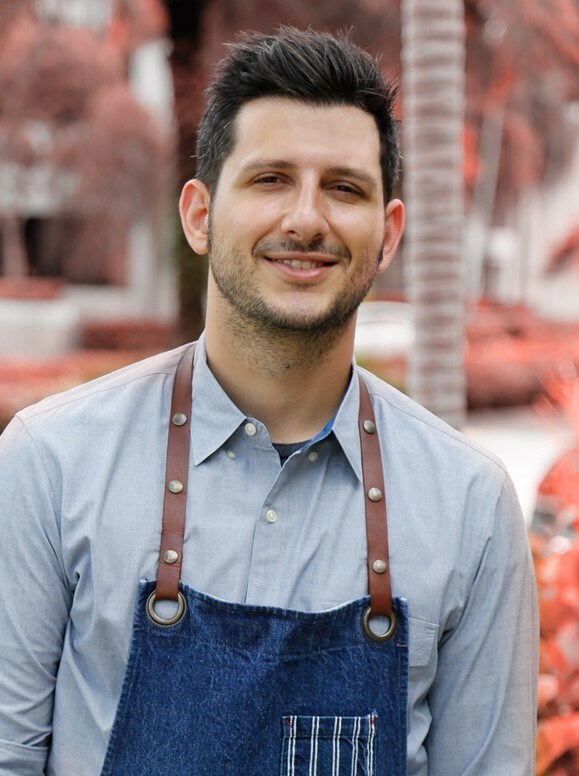 Born and raised in Miami to an Italian mother and an Argentine father, Rapicavoli’s love of cooking ignited at age five when he and his mom would spend Sundays in the kitchen making her beloved pomodoro sauce. After high school, Rapicavoli enrolled in the Culinary Arts program at Johnson and Wales University, where he upheld a nearly perfect GPA and a repeated standing on the Dean’s List. Alas, never one to be called conventional, Rapicavoli dropped the program a semester short of graduation to dive full-force into the industry. He took turns working under renowned chefs Robin Haas and Adam Votaw, was the executive chef at Chispa Doral at just 21 and then honed his craft during his three-year executive chef stint at 660 at The Angler’s on Miami Beach. The cuisinier has been a repeat guest at Slow Food’s Terra Madre in Italy alongside the likes of Ferran Adria, Alice Waters and Josh Viertel, an experience Rapicavoli attributes to changing his life, as well as his understanding of food. In 2011, he filmed an episode of the popular Food Network show Chopped, blowing away the judges and host. Launched in February 2012, using his winnings from Chopped, Eating House pop-up instantly became a Miami favorite, creating a cult following of avid imbibers chomping at the bits to see what Rapicavoli would create next. Innovative, fun and funky twists on mostly comfort food, were dished out to blissful guests for seven months before it closed, as planned, at the end of September 2012. In November of the same year, the Miami community rejoiced as Rapicavoli and business partner Alex Casanova announced they were purchasing the cafe from its owners and would open the permanent outpost of Eating House, now a Coral Gables institution. Rapicavoli’s energy, momentum and passion continued past the doors of Eating House. In 2014, he conceptualized and executed Tartare Bar, his successful four-day pop-up at the World Golf Championships – Cadillac Championship in Doral, Florida. He repeatedly cooked at prestigious events such as Sundance Film Festival’s ChefDance, Foreign and Domestic Chef Ned Elliot’s Indie Chefs Week in Austin, Texas, and Identita Milano, Italy’s famous international cooking convention. Rapicavoli has been recognized by various national and local outlets, including Travel + Leisure; The New York Times; The Cooking Channel’s Unique Eats; Forbes Magazine’s 30 Under 30; two-time nominee for Food & Wine’s “The People’s Best New Chef”; James Beard Rising Star Chef 2013 semifinalist; James Beard Rising Star Chef 2014 nominee; James Beard Best Chef South 2016 semifinalist and more. Refusing to slow down, Rapicavoli and his team opened a second restaurant project, Taperia Raca, to immediate success and sold it for profit with plans to take the concept elsewhere. He was also invited to return to Food Network’s Chopped Champions where he won again and went on to compete in the Ultimate Champions Tournament. Then in 2015, Rapicavoli partnered with the boutique culinary firm Grove Bay Hospitality Group to open the intimate garden oasis, Glass & Vine, in Coconut Grove’s iconic Peacock Park. He sought inspiration for the restaurant through a culinary and cultural tour of Europe, and the influence of which is reflected in his unique creations and flavorful menu; which offers shareable, European-inspired vegetable, seafood and meat dishes, plus unique craft cocktails.